« Have Beautiful Holiday Skin ~ Stock Up On These Good Foods for Healthy Skin! Unfortunately, as we age our eyesight and hearing capabilities diminish somewhat. Simple tasks like dialing a phone number or listening to an important phone call can prove especially challenging. RadioShack, a leader in consumer electronics, carries a wide variety of Clarity phones. These specialized telephones use Clarity Power technology which enables loud and clear conversation, allowing much better communication than on a standard telephone. I recently had the chance to review the Clarity D613 Amplified Cordless Phone with Digital Answering Machine from RadioShack. Keep reading to learn more! I reviewed the Clarity D613 Amplified Cordless Phone with Digital Answering Machine from RadioShack, which retails for $89.99, but is currently on sale for $79.99. 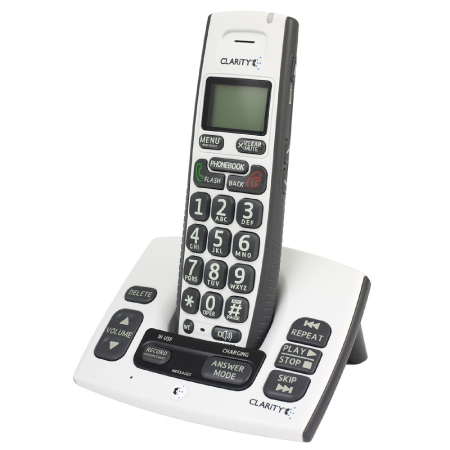 The Clarity D613 Amplified Cordless Phone with Digital Answering Machine has many features which will help anyone with visual or hearing impairments enjoy a conversation on the phone again. The Clarity D613 cordless Caller ID telephone, featuring Clarity Power technology, improves conversations by making words not only louder but also clearer and easier to understand. With up to 30 decibels of amplification, the D613 is ideal for those with hearing loss, and the large, soft-touch buttons are useful to those with declining vision. I really liked the Clarity D613 Amplified Cordless Phone as a gift for my grandparents. Now, my grandma doesn't have to find her reading glasses and squint tightly in order to dial a phone number. My grandpa can also enjoy an entire phone conversation without having to ask over and over that something be repeated back because he didn't hear it right the first time. What's more, the Clarity D613 is even expandable up to five handsets, so that you can easily get one for every room in the house. This would make me feel more at ease, knowing that should they slip and fall or have an injury at any time, help is almost at their fingertips. If you have more than one handset, you then have an instant in-home intercom system, with no more yelling across the house in order to talk to another person. I highly recommend the Clarity D613 Amplified Cordless Phone from RadioShack as an essential product this year for anyone with either visual or hearing impairments. Disclosure: I received the Clarity D613 Amplified Cordless Phone with Digital Answering Machine from RadioShack in order to facilitate my review. No other compensation was received. This product review is based on my own personal experiences with this item and is completely honest and objective.